Evergreens, the rock stars of our winter gardens, likely flourish in your yard or neighborhood. You may even have used them in flower arrangements in the past. You can preserve fresh evergreens for a longer life and use them in dried flower arrangements. Ivy preserves in thee to six days. Cut fresh, unblemished foliage. 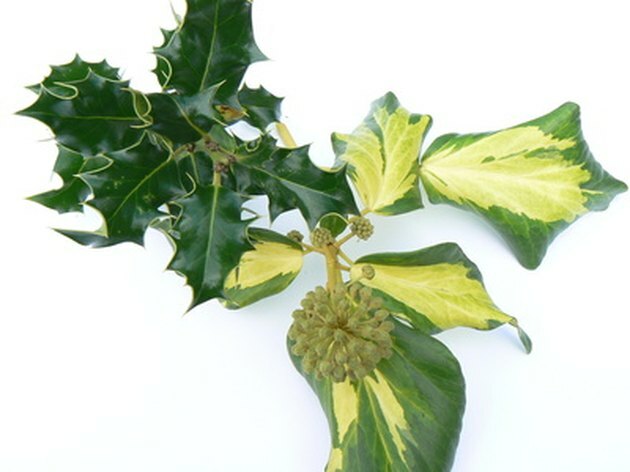 Good choices include holly, magnolia, ivy, nandina, juniper, ligustrum, mistletoe and boxwood. Harvest the material at midday when the water level within the plant is at its lowest point. Do not place cut foliage in water. Thirsty foliage will absorb the preserving solution more rapidly than well-watered material. The success of this drying method depends upon the material's rapid absorption of the preserving solution. Mix a preserving solution using a ratio of one part water to one part glycerin. Add one tbsp. bleach for each cup of water to keep the solution fresh. You may also add florist dye to the solution at this point if desired—most foliage fades or turns brown during the preserving process. You'll need 4 to 6 inches of solution in a container large enough to support your foliage. Re-cut any stems before placing in the preserving solution. Pound the ends of woody stems with a hammer to increase solution absorption. Arrange loosely in the container with preserving solution. Place the container with foliage in a cool area with good air circulation. Replenish the solution as it evaporates. Average processing time for woody-stemmed foliage is two weeks, but if your foliage begins to wilt, remove it immediately. Remove the preserved foliage from the container and spray it with an anti-transpirant. Anti-transpirants, such as Moisturin or Wilt Pruf, protect plants from drying out too rapidly. Your dried evergreens can now be stored or used in flower arrangements.